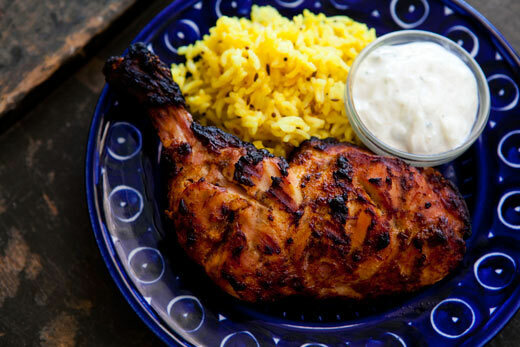 Indian dish - "Tandoori Chicken"
Chicken Sagwala Indian restaurant dish "chicken spinach"
You have not eaten real chicken, if you have never enjoyed the taste of the chicken Tandoori. - Ham chicken — 4 PCs. Cut from chicken thighs to remove from it a skin and to make many arbitrary cuts. To join in a saucer of salt, paprika and pepper on a teaspoon. Diligently to mix. RUB the mixture into the incisions made on the thighs. Pour half of the lemon juice. To make the brine. Pour into a saucepan half a Cup of yogurt and remaining lemon juice. To put back the garlic, ginger and salt one tablespoon. Append to the resulting mass of spice. Mix everything carefully. Carefully smear the chicken thighs and remove for 24 hours in the refrigerator. The oven is heated to 220 degrees. Lay out marinated thighs on the grill and cook them for 40 minutes. The chicken's ready.